Social Work is a vast field with many specific specializations and niches. Social Workers are, in most cases, responsible for facilitating the delivery of social services to those in need of them. This spans every demographic, each with their own sets of needs. This can be daunting, especially for those just about to enter the field, and that’s where this guide comes in. 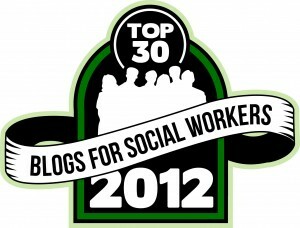 Listed here are thirty blogs representing various points of view among social work professionals. These blogs cover a wide range (though certainly not all) of the opportunities available in the social work field and will hopefully give social workers of all levels, especially students and those recently graduated, the perspective they need to find their passion. 1.National Association of Social Workers Blog is the blog of one of the primary advocacy organizations for those in the social work profession. The blog posts are written by highly regarded practitioners and academics in the social work field. 2. The New Social Worker is the companion blog of the magazine that shares its name. The blog focuses on updating the readers of the magazine with news, information, and articles in between the issues. 3. The Social Work Blog is a collaborative effort featuring articles from some of the top practitioners and thinkers in British social work. Though British, this blog contains content that can be applied internationally. Highlight: Should Civil Servants be Required to Spend Five Days With a Social Worker? 4. Everyone Needs Therapy is a multidisciplinary blog that focuses on posting in depth articles that have to do with some of the most prevalent mental health issues of the day. The blog is editorial in style and not meant as a replacement for therapy, but to help people understand that they are not alone. 5. Social Work World features editorial style posts that consider the implications of current events from a social worker’s perspective. The blog is designed to be appealing to social workers at all levels, from students to retirees. Highlight: Mental Health and Gun Control: Anything New? 6. Christina’s Considerations features articles focused on the major issues facing hospital social workers, including issues of workplace effectiveness, enhancing the patient experience, and keeping up with the innovations in health information technology. 7. Theravive is the editorial style blog about life and living, written by multiple M.A, M.S.W, and Phd contributors, who are primarily marriage therapists but deal with a broad range of issues such as parenting, anxiety, depression, conflict, boundaries and more, most of which will be very helpful to social workers on several levels. 8. Social Work Tech Blog features the writings of social worker Ignacio Pacheco and is a great resource for anyone interested in integrating technology into their jobs as social workers and other related fields. Most of the resources he shares are free or low cost. 9. Cyber Social Worker deals with the challenges of new technology and personal use of social media facing social workers. The blog also covers innovations, and strategies for keeping your private life private on the internet. Highlight: Is Online Privacy an Oxymoron? 10. Anti-Social Worker is a unique blog in that the author is a social worker who struggles with anti-social tendencies. The blog is a “day in the life” style, that provides social workers with tips and advice for surviving the workplace and achieving success in the field. 11. Stories of a Burned Out Social Worker lets you get a look inside the life of a social worker who works in a California Hospital. The primary purpose of her blog is provide a support system for social workers stressed out by their jobs. She recently added a message board and chat feature to the blog so that social workers can interact. 12. This is Me features stories from the life of a social worker on the quest for self awareness. Follow along as she shares stories about her life, and how her experiences have helped her peel back her layers to come to a better understanding of who she is, and what she wants. 13. Awake and Dreaming, the Ramblings of a Social Worker is a day in the life blog of a social worker featuring posts that are sometimes about social work, and sometimes about just figuring out life and chronicling personal breakthroughs. Though many of her posts are more personal, she also speaks up about important social justice issues. 14. Life of Wangene is an incredibly unique blog featuring the thoughts of Wangene, a Kenyan who came to the U.S. to pursue a degree in social work and raise awareness of the myriad issues faced every day by the people of her home country. This blog features a much different, valuable perspective. 15. SocialWrkr24/7: Eyes Opened Wider is a blog focusing on chronicling the lessons the author learns from every day life, and helping other people learn those lessons through her. She brings a unique perspective being both a foster care social worker and a foster parent. 16. Harlow’s Monkey is a blog all about the ins and outs of adoption, from the perspective of an author who was, herself, adopted. The blog features extensive articles dealing the major issues in the modern adoption system. 17. Hold My Hand features posts derived from the author’s life and professional experience as a social worker. She writes of this experience most often through stories, complete with characters, internal monologue, and dialogue. 18. Social Work Helper is a networking community for social workers. The website features numerous bloggers each with their unique take on the social work field, as well as other important resources and a large community with which to interact. 19. Social Work Career Development shares the views and experiences of its author, a clinical social worker, on mental health and other issues. The blog also strives to post career resources helpful to social workers. 20. Karen Zgoda is a graduate student in social work at Boston College and her blog focuses on innovation in the field of social work and strategies for adapting technological innovations to fit your social work needs. Highlight: Preventing and Responding to Gun Violence- Where do Social Workers Go From Here? 21. Classroom to Capitol is a blog that focuses on Washington D.C. social justice advocacy and lobbying efforts. The blog deals with specific issues, and offers a personal perspective on how to go about lobbying for change successfully. Highlight: Is There Such a Thing as too Passionate to Advocate? 22. The Political Social Worker is a social work advocacy website that features a blog where advocates post progress updates on their efforts. 23. Nicole Clark, MSW focuses specifically on improving the lives of girls and women of color. The articles here seek to explore innovative ways of affecting the lives of many that the greater system has failed. 24. Medicine Social Justice is the blog of a medical doctor educator and it focuses on the lack of available medical care to the poor, and on social justice strategies and insights from somebody on the medical side of the fence. 25. Social Work, Social Care, and Media is a blog where individuals within the social work and social care community interact. The people here are academics, practitioners, researchers, lobbyists, and users of service. Anybody who is involved with the social work and social care landscape in any way is welcome to share their ideas. 26. Notes from an Aspiring Humanitarian is the blog of a man who grew up in poverty, and understands the climate that exists in cities like Detroit. He has dedicated his life to humanitarian causes in the United States, and these are his stories. 27. The Social Issue is a blog run by a social affairs journalist. The blog provides readers the unique opportunities to also become writers, and contribute to the blog’s content, helping bring together numerous perspectives and promote healthy discussion. 28. Martin Webber’s Blog features the musings of this social work academic. Webber tackles the big issues in social work academia, and also points out areas that are lacking research, and areas that need to be researched but for which there is little to no funding. 29. JaeRan Kim uses her blog as a space to post her thoughts and insights on topics within the social work field such as ethics, research, education, policy, and theory. 30. Not So Big Society embraces off beat strategies for raising awareness about health and social care and trying to shed light on abuses within government and private health and social care.